Below is a list of sessions that may be of interest. 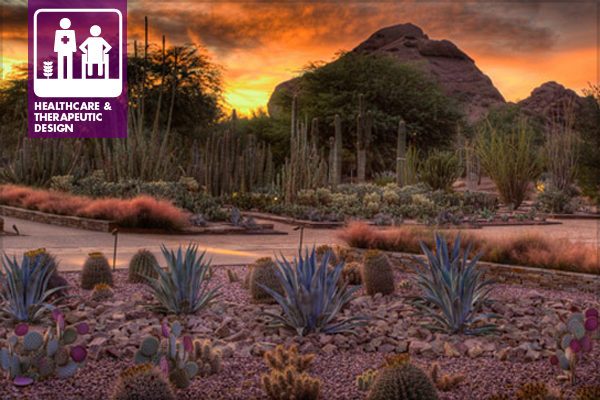 Organized by Phoenix landscape architects with a special interest in outdoor healing environments, this tour focuses on five healing gardens, including designs by ASLA Award recipients Kris Floor, FASLA and Christy Ten Eyck, FASLA. Experience how these gardens enhance well-being, not only for healing patients, but also for their families and caregivers. Create mutual and self respect for the entire community through education and accommodation. Improve communication by connecting individuals with ASD to the rest of the community. Provide sensory integration and reduce isolation in increments each child can control. Explore current trends and issues affecting playground design, including safety and accessibility. Learn how designers can work with regulations without sacrificing the play in playgrounds. Increase knowledge of how designers work with civic clients and communities for playgrounds. Jinny Blom’s involves meticulous attention to the structure of a garden or landscape so that the overlay expresses its true spontaneous nature. Designs express sound proportions, intelligent planting, and fine materials, from which comes the freedom to suit any and every circumstance. Develop the process of “breakdown and repair” at every level of coherent and intelligent thinking. Value the true worth of all involved: people, place, materials, and all forms of life. Consider matters beyond the span of our own lives. Many healthcare facilities are integrating previously under-appreciated outdoor environments into their wellness strategy, with these new natural settings labeled as healing or therapeutic gardens. This session examines the issues surrounding healthcare gardens and evaluates why some succeed while others may fail. Describe changes in medical models and how they affect healthcare design. Learn the processes and constraints of designing in the healthcare field. Evaluate gardens to identify areas for improvement and missed opportunities.